Theft is an ever-present threat in many sporting club venues and the golf clubhouse is no exception. A clubhouse is a busy place with members, staff and other visitors in and out all day long, and as a result creating a safe and secure environment to protect club and members’ property is likely to be high up on the facilities manager’s priority list. Traditional key-operated locks offer good levels of security, but only when the keys can be properly managed. Key management becomes more problematic as the number of key holders increases, as it would in large clubhouses with lots of doors. Every time a key is lost the lock (and keys) should be replaced in order to maintain security. Although the use of key-operated locks may seem to be the obvious solution to controlling access, managing multiple key holders who have access to multiple locks can quickly get out of hand. That is why more and more facilities managers are choosing to replace locks and keys with a more convenient and modern method of door entry. A keyless entry digital door lock is a standalone access control product that offers greater functionality over traditional locks and keys. Access through the door is achieved by keying in a code on the keypad. If you don’t have the code, you can’t get through the door. The coded locks can be used as primary locks on most doors, including wood, aluminium and even glass. Codes are issued to appropriate members of staff for entry to rooms or areas within the clubhouse where access needs to be controlled, for example, in areas where equipment is stored, the kitchen, meeting rooms or office areas. If a staff member leaves, the code can be reset and issued again. Making regular access code changes will ensure a push button door lock remains effective and help deter codes from being misused or passed on. It’s not just doors that can be secured using keyless entry door locks. Digital locks are also available for lockers as a replacement for traditional key cam locks. The locks work in exactly the same way; using a code to unlock the locker, not a key. The main advantage here is that the user of the locker does not have to carry a key around with them while they are on the golf course. It’s far easier for a member to lose a locker key than it is to forget a four-digit code. However, if a member does forget their code, then a master code will open the door to the locker. This process is far easier than having to break the lock open or to arrange for another key to be cut. It also means the locker does not have to be ‘out of action’ while the situation is remedied. 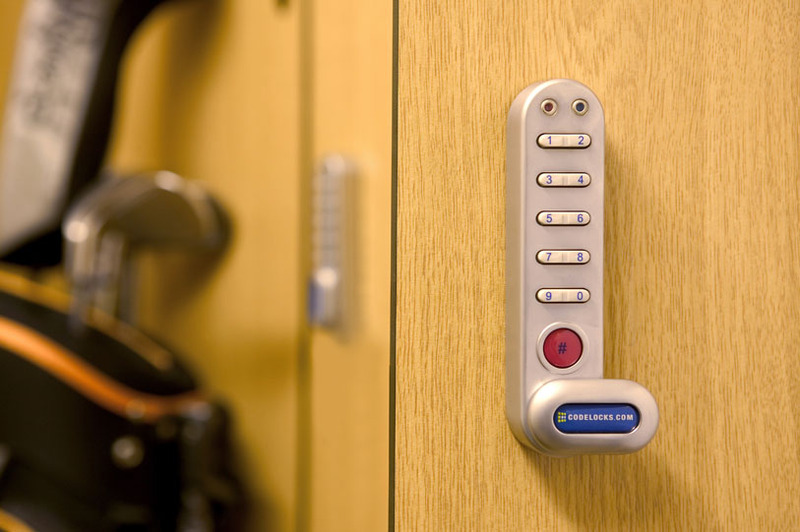 Deanwood Park Golf Course in Newbury, Berkshire, has recently replaced its locker keys with KitLock digital cabinet locks. Prior to this, club members had to ensure they had the right change in order to use the lockers. Some members even kept their locker key when they went home to prevent anyone else using the locker. 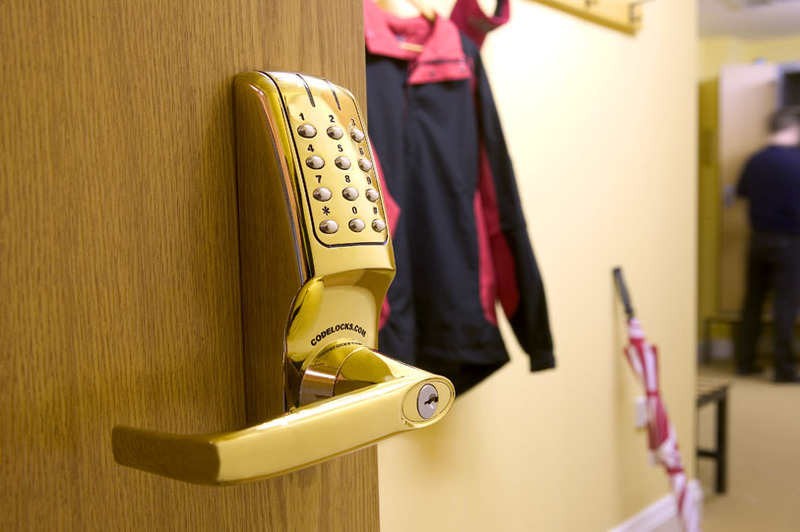 There are many applications in the golf clubhouse where digital keypad locks can provide a cost-effective and manageable level of access control, without the hassle of using keys. For more information on the Codelocks range of electronic locks, visit our website or call us on 0800 393405. Keyless entry door locks: which is best?